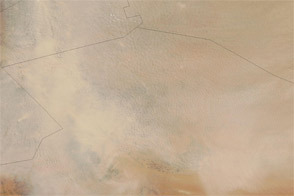 Satellites often observe dust swirling over remote and unpopulated deserts but most of these events go largely unnoticed. Not so with the major dust storm that made international news in September 2015 for enveloping heavily-populated areas in the Middle East and North Africa. 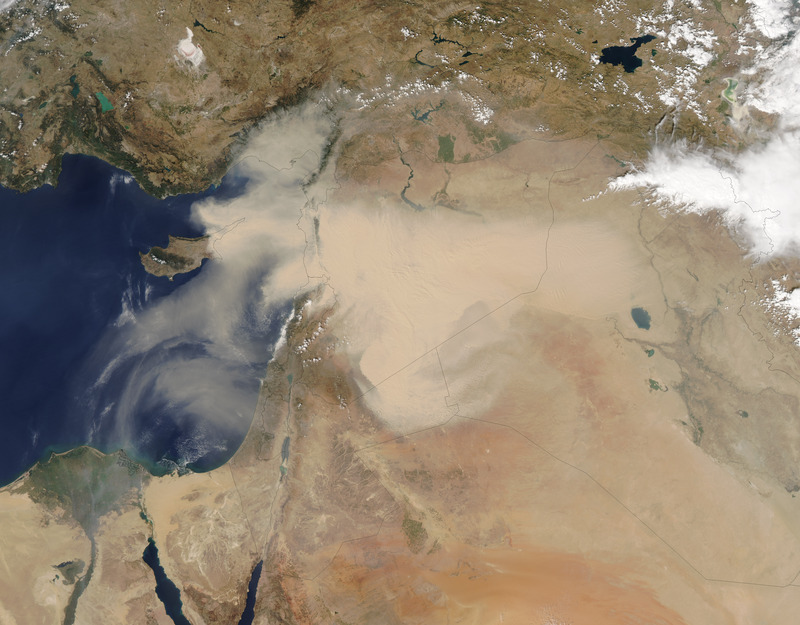 Dust first emerged in Moderate Resolution Imaging Spectroradiometer (MODIS) satellite imagery in Syria on September 6, 2015. 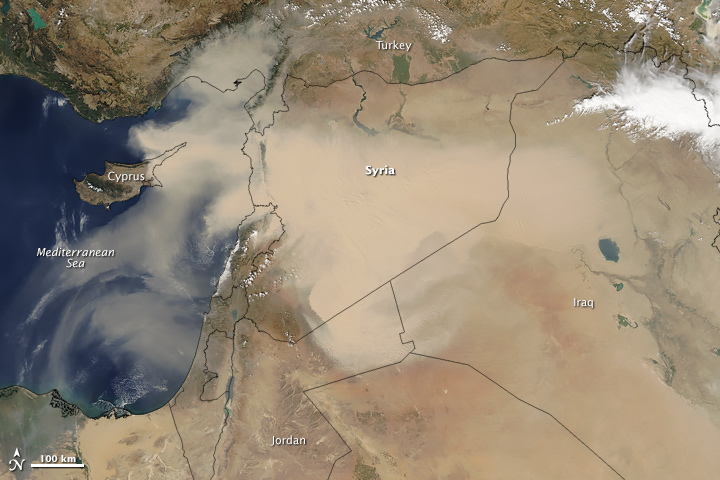 By September 7 (top image), a thick plume swept across Syria, the Mafraq region of Jordan, and part of Turkey’s Mediterranean coast. 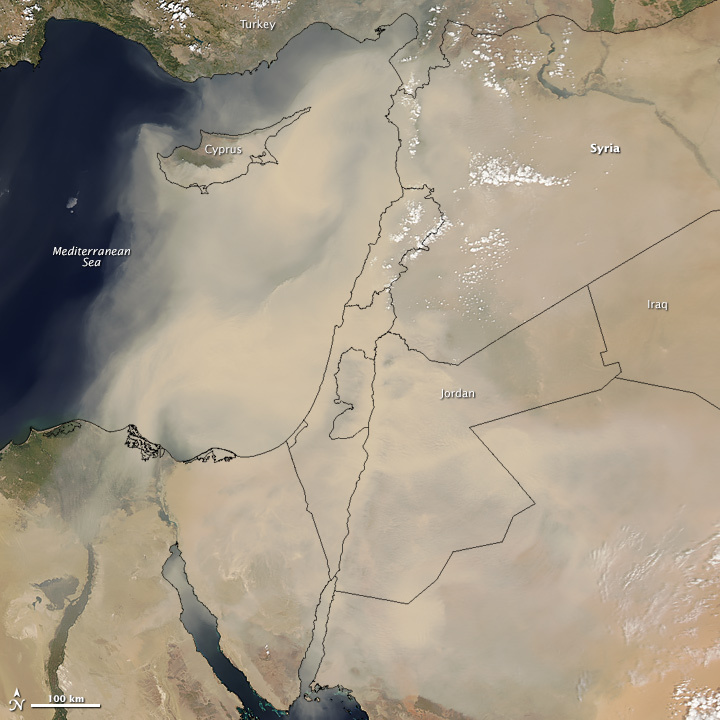 By September 8 (bottom image), dust had enveloped all of Lebanon, Israel, Jordan, Cyprus, and the Palestinian Territories. By September 9, it had moved southwest and spread over northeastern Egypt and the Gulf of Suez. The influx of dust triggered a rash of canceled flights, closed ports, and a suspension of daily activities for many people. In several countries, authorities are advising the elderly and young children to stay indoors. The number of people visiting hospitals with respiratory problems has increased significantly, and several deaths have been attributed to the dust, according to media reports. 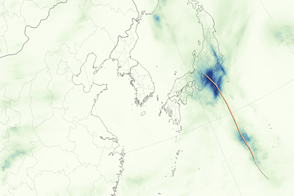 While satellites observe the dust from above, air quality sensors on the ground are recording remarkable amounts of particulate matter in surface air. In Jerusalem, pollution levels were 173 times higher than average, according to one news report. A sun photometer at the Sede Boker AERONET station in southern Israel showed a dramatic increase in aerosol optical depth (AOD)—a measure of how much sunlight is scattered by particles in the atmosphere. One study led by Paul Ginoux of NOAA’s Geophysical Fluid Dynamics Laboratory found that about 75 percent of global dust emissions were natural, while 25 percent were the result of human activity. For the purposes of the study, dust sources were considered natural if less than 30 percent of the land around a dust source—usually a dried body of water—was used for agriculture. Agriculture is associated with dust events because disturbing soils, removing vegetation cover, grazing by livestock, and draining surface water makes it easier for winds to pick up and transport dust. Based on Ginoux’s line of research, the dust sources in the current event in Syria would appear to be anthropogenic. 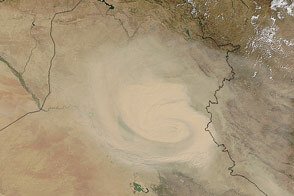 A large agricultural region northeast of Raqqa is known as a particularly abundant dust source. 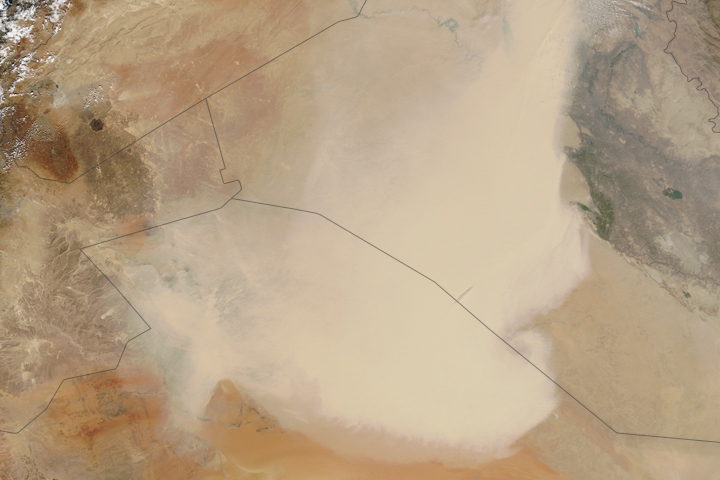 In addition, there are several salt flats along the Syria-Iraq border that contribute dust. 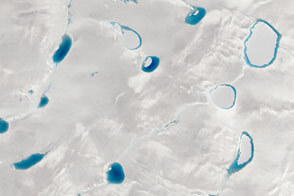 Satellites provide a unique and valuable view of dust. 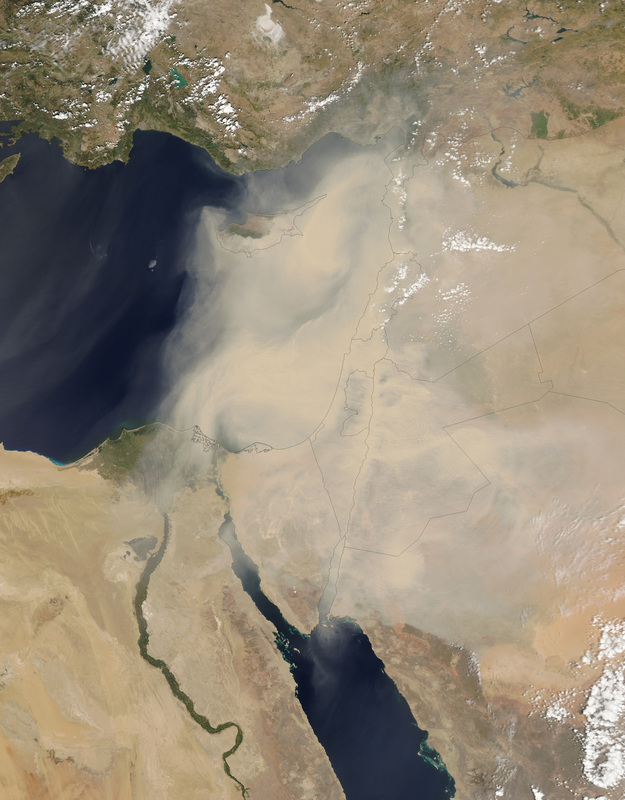 A cyclone-shaped wall of dust traversed the Middle East and Persian Gulf in September 2015. Albawaba (2015, September 8) Incredible photos show what the Levant looks like covered in sand. Accessed September 8, 2015. BBC News (2015, September 8) Middle East dust storm puts dozens in hospital. Accessed September 8, 2015. Ginoux, P. (2012, August 8) Global-scale attribution of anthropogenic and natural dust sources and their emission rates based on MODIS Deep Blue aerosol products. Reviews of Geophysics, 50 (3). Mashable (2015, September 8) Huge dust storm roars through Middle East, sending hundreds to the hospital. Accessed September 8, 2015. World Meteorological Organization (2015, September 7) Compared dust forecasts. Accessed September 8, 2015.